As an organisation we are committed to doing the same. Our work isn’t just about providing a sticking plaster when things go wrong for children. We are committed to speaking out to local councils and government to mend the systems that trap children in vicious cycles of disadvantage and neglect. We have prayers, church magazine articles, and worship materials supporting our current campaigns. Use these to bring the issues before God and to inspire your congregation to speak out for lasting change. As Christians, we have a responsibility to ensure that our communities practise inclusivity, prioritise respect and extend welcome without compromise. Throughout the biblical narrative, we see strangers welcomed, and those who are living in fear protected and supported, so that they might flourish. We invite your church to become a place of safety for vulnerable young refugees. ‘Becoming a place of safety’ is a resource to help churches welcome refugees, in Refugee Week and beyond. It’s filled with ideas of ways in which you might make a difference: from writing a message of solidarity to refugees arriving in this country, to speaking out on behalf of vulnerable young people in your community. For more information about a biblical mandate to welcome the stranger, you can read our theology paper: ‘From fear to safety’. Our Hat·tê·ḇāh initiative aims to equip participants to better understand and respond to the issues faced by young refugees, through the delivery of free awareness-raising training. Hat·tê·ḇāh is a partnership initiative run by us, Mothers’ Union and Home for Good, alongside the Church of England. By working together, we hope to further the reach of this training and achieve more change for vulnerable young people. Do get in touch if you would like more information. The vast majority of parents try to build normal lives for their children, but too often unmanageable debt wrecks their efforts. A simple setback can push families into The Debt Trap. Debt can damage a child’s mental and physical health. It can undermine relationships with peers and their school experiences, and cause long-term harm to a child’s life. 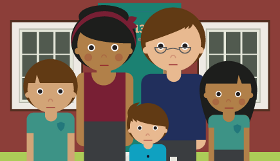 You can join us in campaigning for a statutory ‘breathing space’ in order to enable families to have the space and time they need to repay any debt. Read about the theology related to the campaign and use our Bible studies and worship materials to explore the issues with others. Find out how you can get involved in The Debt Trap. Our Seriously Awkward campaign reveals that because of their age, the most vulnerable 16 and 17 year olds are falling through the cracks of childhood and adulthood. They are being let down by the law and not getting the same basic protections as younger children to keep them safe. You can sign our petition, calling on the Government to change the law to ensure 16 and 17 year olds are fully protected when they are at risk of harm, abuse or neglect. Read our theology papers which discuss the issues behind the campaign. Use our new youth group resource focussed on young people's well-being, body-image and self-esteem. Learn more about our campaigning successes. If you’d like to take a lead in bringing change to your community, you can sign up to become a Campaign Champion. By giving up a little bit of your time, you can help make a massive difference. People think campaigners are a certain ‘type’ of person, but that’s not the case. Take our quiz ‘what kind of campaigner are you?’ to find out what type of campaigning approach you have. Our monthly prayer email is a great way to keep up to date with information about the impact church support is having on the lives of young people, and how you can best pray for them.